The end of an empire is a dramatic but also drawn out event with very few willing to face the facts. As the end is getting closer, denial is at its peak. We can probably figure out how it will end but not quite when. Looking at the facts, the beginning of the end is here. The signs are clear. Here we have a country that for the last 27 years has doubled debt every eight years and the trend continues uninhibited. This is a country that for decades has been living above its means by borrowing unlimited amounts. Well, it is not a Banana Republic, nor Argentina or Venezuela but the biggest economy in the world – the soon not so great USA. The US economy is just like Humpty Dumpty, big, fat and unlikely to recover from the coming fall for a very long time. The road to perdition normally takes many turns. But not in the case of the US. This has been a straight road to what will be the most spectacular fall in economic history. Since 1960 US debt has increased every single year without fail. There are some who are under the illusion that the debt went down in the 1990s due to surpluses in the Clinton years. But these were fake surpluses and the debt continued to rise also during that period. In 1960 the debt was $286 billion and it reached $1 trillion when Reagan become president in 1981. This much admired president managed to almost treble US debt during his reign. No wonder he was popular, especially since he also managed to send the Dow up 2.5 times after a decade of sideways markets. He was a hero and that was certainly deserved. But being a hero involves a great deal of luck in timing. Both Reagan and Thatcher were instruments of their time. After a long period of high inflation, high rates and low economic growth, these two individuals were the right leaders to steer their countries towards better times. But sadly that also involved spending money that you don’t have. This was Keynesian economics at its best. Borrow and spend and then borrow some more and spend that too. This is when the era of the rich getting richer started in earnest with wealth concentration benefitting an ever decreasing part of the population. 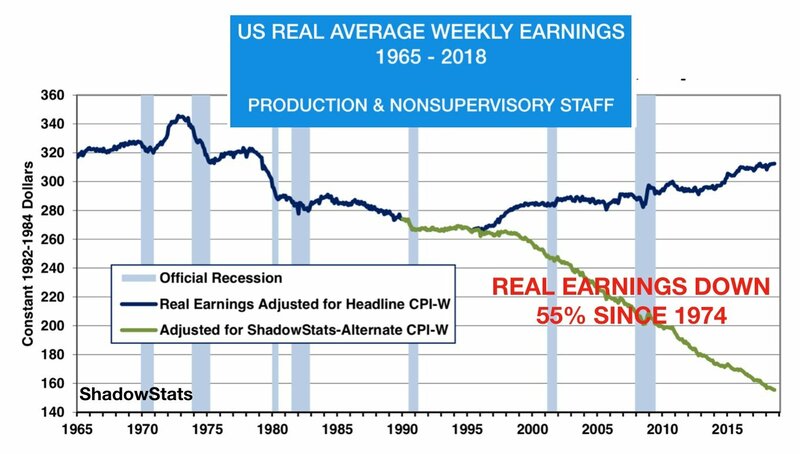 At the same time, ordinary workers have experienced a massive 55% decline in real wages since 1974. The image above is disturbing not only due to the galloping debt level but also because tax revenues are growing at a snail’s pace. 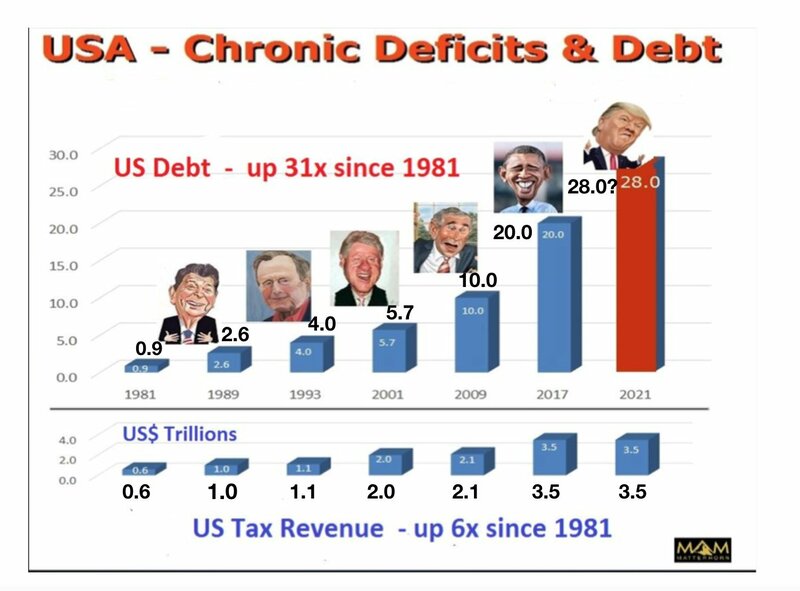 Debt is up 23 times from $0.9 trillion in 1981 to $21.5 trillion today in 2018 and tax revenues up only 6 times (Illustration above shows debt forecast to 2021). How does anyone believe that the stagnant or falling tax revenues will ever be sufficient to reduce the debt. History is telling us differently. The US economy is heading towards bankruptcy in no uncertain terms. The Fed’s only remedy will be to print unlimited amounts of money until the dollar has become totally worthless. Trump inherited a debt of $20 trillion and whether he or someone else will be there 8 years later, it seems quite a sure bet that debt will at least double to $40 trillion by 2025. 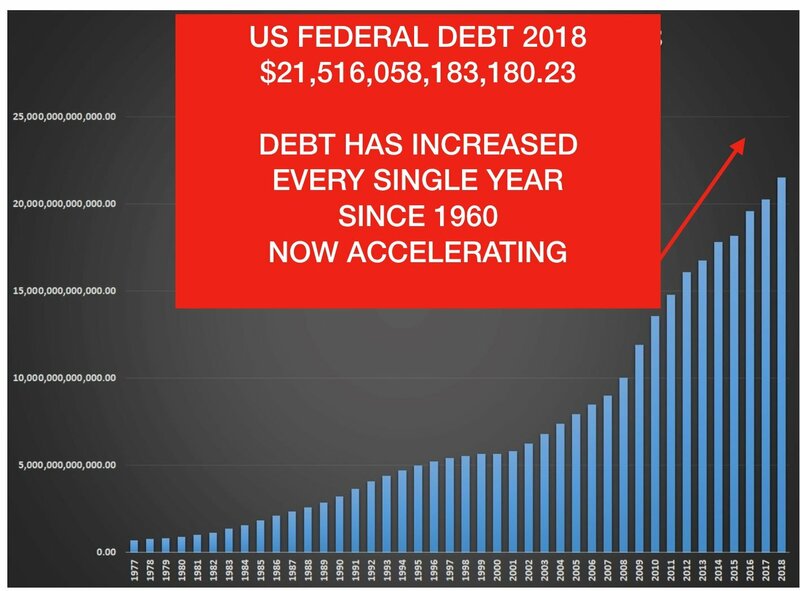 Whether or not the debt will reach $28 trillion at the half way stage in 2021, as I have forecasted in the graph above, we will soon know. That would mean an average deficit of $230 billion per month in the next 28 months. Since the August US deficit was $214 billion, the $28 trillion doesn’t seem too unrealistic. 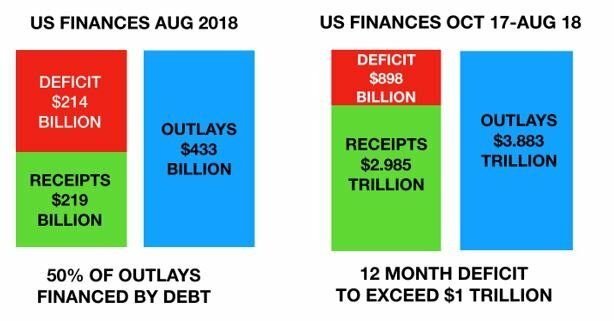 What we know is that debt is already at $21.5 trillion or $1.5 trillion above the level when Trump took over 19 months ago. And remember this is with a booming economy. But the finances of USA Inc are not that great. In August for example, half of the budget Outlays were financed by debt – a very disturbing trend if it continues. The biggest factors that will send the debt soaring will be higher interest rates and higher deficits. Interest expense on the US debt in Fiscal 2017-18 was $365 billion. As I discussed in last week’s article, interest rates have turned up and are likely to rise to the 1981 high of 16% at least. As deficits grow and bond prices collapse, the Fed will totally lose control of the long end of the debt market. The biggest creditors, China and Japan will most certainly assist in this process. Falling bond prices and a falling dollar will make them rush to the exit as quickly as possible when there is still some value left. Let’s say that in the next few years debt reaches $28 trillion and interest rates 10% whilst tax revenue declines by 15%. At that point, all tax revenue will be absorbed by the interest expense. I realise that these are assumptions that might not sound realistic today. But in my view they are probably too optimistic. The 2007-9 crisis was never solved but only deferred to a later date. All the problems that caused that crisis are still there. But the cost of deferral has been massive since global debt has doubled from $125 trillion in 2006 to $250 trillion today. Adding unfunded liabilities and derivatives, the world is sitting on the cusp of a crisis that is exponentially greater than in 2007. Thus the likelihood is that the Fed will need to print not just $10s of trillions but $100s of trillions to save the financial system, and prop up most areas of the economy including pensions and social security benefits. At that point bonds will crash and interest rates reach at least 25% like in Turkey today or more likely 60% as in Argentina. The US will then have reached the hyperinflationary stage with a collapsing dollar and a failing economy. The social implications will be horrendous and there is likely to be civil unrest as poverty and famine grip the country. The US will of course not be the only economy that will fail, but as the biggest it will have the hardest fall just like Humpty. Around the world, many markets are now giving clear signs that the coming global downturn has started. Stocks in Hong Kong, Brazil as well as the Emerging Market Index are all down 20% in 2018 and China is down 25%. With 19 Hindenburg Omens since August (a very bearish technical signal), the US market looks extremely vulnerable. So do most major markets around the globe after one of the longest and steepest bull markets in history. Whether or not we will see a final exhaustive up move or not is irrelevant. Risk is at a maximum and we are very near the start of one of the biggest secular bear markets in history. Now is the time to be safe rather than sorry. Precious metals are showing clear signs of ending the long correction down since the 2011 peak. Once the turn is confirmed, which could be any time, the 18 year bull market in gold and silver, will resume towards new highs and beyond. But wealth preservation investors who hold physical precious metals should not be impatient. These holdings represent the best insurance that paper money can buy. Once the metals move to much higher levels, the world we now live in will look and feel very different. So enjoy the good times, quality of life and peace we have today. Because much higher gold and silver prices will sadly be connected with a very different world.